Can Beginners Use Janome Magnolia 7330? 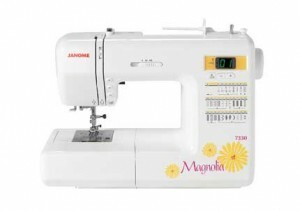 The Janome 7330 is the most advanced machine in the Magnolia series of sewing machines. The Janome Magnolia series in particular is very popular choice for beginners and intermediate users. They are known for their quality, reliability and power. They are also known for their ease-of-use. A beginner would have no problem learning to sew with this machine. The computer is super easy to set up, and the LCD screen lets you know exactly what selection you are have made. Automatic threading, bobbin-winding, feed dog system and buttonholes are particularly easy and can be done with the push of a button. This machine may look pretty, but it isn’t delicate. It has a strong motor that can power your needle through many layers of fabric. I have used it on multiple layers of upholstery fabric many times without having a single issue or even feel like I was overworking the machine. Another nice thing about this machine is not having to use the foot pedal. There is a simple start/stop and up/down button that controls the needle. All you do is position your fabric under the presser foot then lower the needle with the up/down button and then lower the foot. The press start. That’s it. It also comes with many different decorative stitches. You don’t need to purchase an expensive embroidery machine to get beautiful embroidery work done on one of your projects. There are numerous options of stitches that are super fun to play with. I can’t really do a review without mentioning how this machine sews. It’s probably obvious by now, but all I can say is this machine does an amazing job. It is quiet, sews a perfect stitch (even the embroidery ones) and all of my projects have come out looking professional. There are so many machines out there that will do the job, but very few that look good doing it. I’ve always loved the look of this machine. It is stylish and pretty. The layout is very functional and the case design is pretty with all of its pretty angles and grooves. The touch of yellow and pink in the flowers and “Magnolia” lettering is feminine, but not overly so. It looks great on my sewing table :). This is a perfect machine for beginners and intermediate users. There are tons of features and a speed control that will allow you to grow with it as your skill and confidence increases. There is very little to dislike about this machine. My only complaint is that it didn’t come with a carrying case. However, they aren’t very expensive and I ended up getting a nice Tutto sewing case that I could use while travelling. The Janome 7330 Magnolia is reliable, does superior stitch-work and is reasonably priced for the quality and features you receive. To get a machine of this quality under $400 is pretty remarkable. If you decide on this machine, you will be very happy with your purchase. I am looking to purchase this machine and wondered if there are nice overlocking stitches? Im debating on trying to accomplish making clothes without purchasing a serger and wondered if this machine could take the place of that. I don’t have access to the janome 7330 right now, but did a quick look at the overlock stitches and didn’t any. I’m not 100% sure though so you may want to check any info on the janome website.